If you’re a current forklift operator or you’re an employer who hires forklift operators, then you already know the importance of forklift training. Forklift training is what gives operators the skills and knowledge they need to understand the workings of a forklift, recognize and avoid hazards, and prevent serious accidents. But what kind of forklift training do you need and how do you get it? Is it hard, costly, or time-consuming? These are some of the top questions we hear in our industry, and our answer for you is: in house forklift certification. ForkliftCertification.com has OSHA compliant training for your company. We’re the #1 option for firms all over the United States, and our training courses are ideal for creating your own in house forklift certification program. Sign up today with ForkliftCertification.com! What is In House Forklift Training? Simply put, in house forklift certification training means forklift training that takes place in your business. If you’re an employee, it’s in your work environment. The great thing about in house forklift certification is that it doesn’t require any travel or time-off to complete, and it’s all at your fingertips, completed on the schedule that’s best for operators and your business. With our Train a Trainer program, you’ll have your own in house safety expert to conduct this training, anytime you need it! 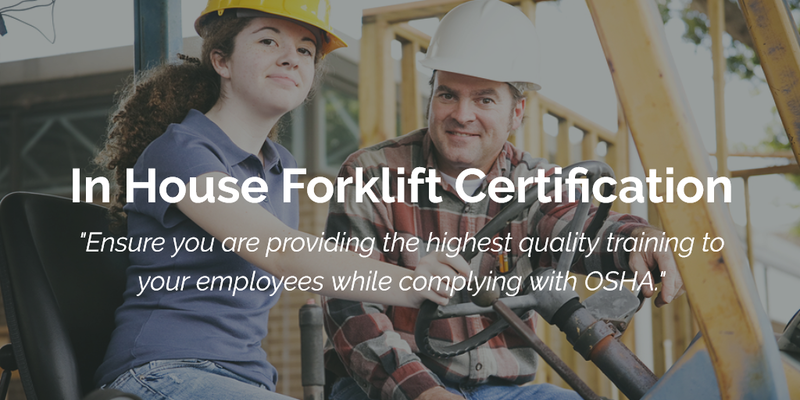 ForkliftCertification.com enables anyone – both employees and employers – to take in house forklift training. Our online learning format is the convenient way to achieve OSHA compliance. And best of all, you can do the training on your own time! • In House Forklift Training Kit – the popular choice for OSHA compliance. • In House Train a Trainer Forklift Instruction – become your company’s safety resource with this comprehensive in house forklift training course. This course gives you the knowledge, tools and resources to set up your own in house forklift training program. • In House Forklift Training Bundle Package – combine the best of both worlds with this combo training course. It includes both of our in house forklift certification packages: Train a Trainer and the Forklift Training Kit. Enjoy the advantages of expert OSHA compliant instruction from the comfort of your own home or office – sign up for our in house forklift training courses today! The biggest benefit to in house forklift training is convenience. Imagine being able to train your new forklift operators in a single afternoon, on the premises of your business, all in a way that is completely legal and OSHA-compliant? Would it save your business money, time, and resources? While there are not any forklift training courses that OSHA has created or endorses, there are certain requirements that training programs have to meet to be OSHA-compliant. • Offer a training program that includes formal instruction in the form of written and interactive computer learning, practical training, and a skills evaluation. This is included with our in house forklift training course catalog. • Provide training that covers truck-related topics and warehouse-related topics. When you sign up for our in house forklift certification, we ensure both tuck and warehouse content is covered – no surprised for your upcoming forklift exam! Luckily, you don’t need an outside training program to cover these requirements. In house forklift training can absolutely ensure you are providing the highest quality training to your employees while complying with OSHA. So how do you get your own in house forklift certification programs? You need qualified and experienced operators who can lead the in-person training components to new employees. The in-person element is the skills evaluation that determines the capabilities of the worker. But it all starts with our Train the Trainer course. The Train the Trainer program from ForkliftCertification.com teaches experienced operators how to lead the training for new workers and qualify them to receive their forklift certifications. You only need to purchase the program from us once, and you can use it to train all of your interested employees that qualify to be trainers. While ForkliftCertification.com doesn’t offer in house forklift training from our own personnel, all of our training packages provide the in house forklift certification experience for affordable, convenient compliance. Once you’ve passed our Train a Trainer course, you can offer in house forklift training to other employees. ForkliftCertification.com gives you both options – a digital, learn-as-you-go in house forklift training option, or a personal learning experience with our Train a Trainer program. It’s all up to you! Please note, ForkliftCertification.com will not send representatives to your company in order to conduct in house forklift training. We allow you to handle it with your own personnel. ForkliftCertification.com empowers companies to conduct their own in house forklift training. Train your own employees in house with our Train the Trainer course from ForkliftCertification.com. Read more about the training kits we offer and reach out to us with any questions! To speak directly with our in house forklift training consultants, please call FLC at (888) 278-8896. Were here to help with your in house forklift certification requirements. Thanks for considering ForkliftCertification.com for your in house forklift training needs – we look forward to helping you today!